On October 27, 1958, at her home, Baltimore street, Aberdeen, (Harford Co.,) Md. 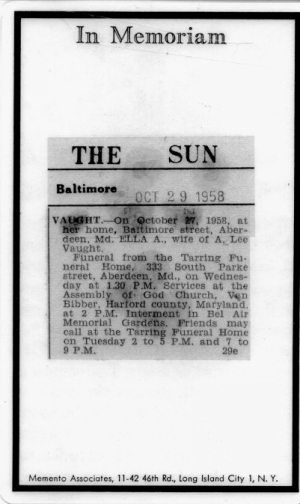 ELLA A., [sic] wife of A. Lee Vaught. Funeral from the Tarring Funeral Home, 333 South Parke street, Aberdeen, Md., on Wednesday at 1.30 P.M. Services ot the Assembly of God Church, Van Bibber, Harford county, Maryland. at 2 P.M. Interment in Bel Air Memorial Gardens. Friends may call at the Tarring Funeral Home on Tuesday 2 to 5 P.M. and 7 to 9 P.M.
Mrs. Ellen A. Vaught, 78, wife of A. Lee Vaught, of Aberdeen, died at her home on Baltimore Street on Sunday. The funeral was held on Wednesday from the Tarring Funeral Home with services at the Assembly of God Church, Van Bibber, at 2pm. Burial was in Bel Air Memorial Gardens. Eight children survive: Dennis and Robert Vaught, Aberdeen; J. Fields Vaught, Fallston; Mrs. Blanche Hills, Crestview, Fla.; Mrs. Jack Henderson, St. Petersburg, Fla.; Mrs. Gus Beeker, Cleveland, NC; Mrs. Gwyn Sanders, Sparta, NC, and Mrs. John Gubble [sic], Bel Air.